This is a magical life time experience that is worth to encounter. You can email us about your conference date and all is made in arrangement as per your meeting schedule. At 4:30 am our safari driver guide will pick you up and drive off to the park. It’s a 2 hour long drive to get to the Volcanoes National Park in Ruhengeri, Musanze province which is a habitat to the endangered Mountain gorillas. You can take visually attractive pictures from the different stopovers along the journey and also get to have a cup of coffee at one of the local restaurant around. At exactly 7.30 am, we move to the park’s headquarters in Kinigi Village where you are briefed by the ranger about the rules and regulations governing Gorilla tracking before you head off to the jungle. The trek can last from an hour to six hours depending on the gorilla movement, but for your case since you will be having a flight on the same day, we will recommend a nearby family easy to trek though the trek is strenuous but much rewarding at the end. You will be given an hour with the gorilla to take as many pictures of your choice and later return to head park headquarters, and drive back to the airport for your flight with an enroute lunch along the way in ones of the local restaurants. Will I be able to see the gorilla in that short time in a day? Most of our clients ask us this question about their worry of not seeing the gorillas, the answer is a YES. You will be able to spot these gentle mammals in their large family led by a dominant silver back. Normal gorilla trekking starts at 8.30 am and the trek can last from 4 – 6 hours, however for this case, our reservation team will notify the park official about your condition and you can be included on a group trekking the Susa family so as you can trek within a short period so as able to enjoy a rewarding experience and later catch up with your flight. 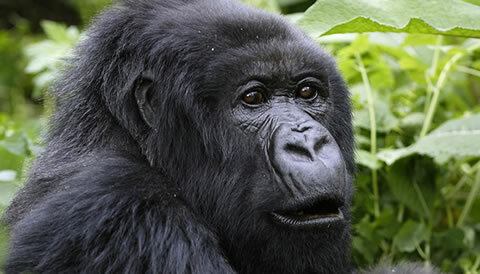 A gorilla permit in Rwanda costs US$ 1500; you may look at it as too expensive but it is all the more breathtaking once you come cross these great mountain gorillas, a lifetime experience within a day in Rwanda. You will be filled with great smile as you relax back on you flight seat, and imagine how great it was getting close to the gorilla in a day. The 1 Day Gorilla Trekking in Rwanda package excludes expenses of personal nature like: Air fare, Visa, drinks, laundry, tips to local guides, telephone, porter fee while trekking, personal insurance, personal shopping bills and cigars.